Comedians often poked fun at Ed Sullivan’s erect, stiff posture, unaware that he suffered from ankylosing spondylitis. 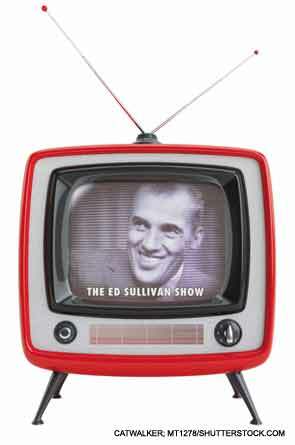 Before there was MTV, there was Ed Sullivan. His Sunday night variety show hosted some of the finest music and comedy acts that were seen on television. Sullivan had a knack for spotting exceptional talent. His show debuted some of the greatest rock and roll bands of the 1960s, including The Rolling Stones, The Doors, The Who and most famously, The Beatles. Viewed by an audience estimated to be more than 76 million people, about 40% of the U.S. population, the appearance of The Beatles launched the first tidal wave of Beatlemania across America and around the world. Unlike his musical guests, Sullivan displayed little stage presence, often bungling his lines as he sauntered stiffly across the stage, arms firmly folded across his chest. Comedians would often poke fun at Sullivan’s wooden style, imitating his erect posture and his odd way of turning his entire body rather than just his neck when looking sideways. Many years later, I discovered the reason for Sullivan’s rigid demeanor. He suffered from ankylosing spondylitis (AS), an ancient disease that has only recently attracted the intense interest of clinicians and researchers. For patients such as Ed Sullivan, what treatment choices were available that would reduce their insufferable stiffness? Sadly, there were very few. High-dose salicylate therapy, an effective remedy for relieving the achiness of patients with rheumatoid arthritis (RA) was ineffective in the AS population. Similarly, the recently synthesized corticosteroids, so beneficial in treating RA and lupus, provided meager benefits. In the 1960s, the mainstay of AS therapy was phenylbutazone (PBZ), or the bute, the first commercially developed nonsteroidal antiinflammatory drug (NSAID) after aspirin. Among veterinarians, the bute was a hallowed drug that seemed to cure horse lameness. The bute achieved notoriety in 1968 when Dancer’s Image, the winner of the Kentucky Derby, was disqualified after traces of it, a banned substance during races, were discovered in the horse’s postrace urine test. Dancer’s Image was retired at the age of 4 and spent his remaining years siring many swift thoroughbreds. Unfortunately, along with power and speed, his offspring carried his trait for developing chronically inflamed ankles. Although many patients considered the bute their panacea for alleviating stiffness and misery, it carried a distressing list of adverse effects, including agranulocytosis and fulminant hepatic necrosis. Not surprisingly, the U.S. Food and Drug Administration banned its use following the release of the next NSAID, indomethacin. The bute wasn’t the only hazardous therapy used to treat AS. The creation of large armies to fight World War II required a massive conscription effort on both sides of the Atlantic. Suddenly, millions of young men were drafted for military duty. As part of the enlistment process, they underwent medical exams that focused on their suitability for duty. For some of these recruits, it was their first encounter with their nations’ healthcare system. Given the huge numbers of draftees, it was not surprising to observe that AS gained prominence as a major rheumatologic disease. In one study, nearly one-fifth of patients with chronic back pain who were admitted to a U.S. Army general hospital were diagnosed with AS.1 But rheumatologists were split regarding the proper clinical designation for AS.